The Blue Ghost Tunnel in southern Ontario looks exactly like the kind of place you wouldn’t want to find yourself alone on a dark night. Measuring just shy of 666 feet, the dim light reflecting off the slime-coated concrete remains of this abandoned railway tunnel should be enough to repel anyone. Abandoned over 100 years ago, the cold, weathered concrete walls stretching into darkness seem to emanate foreboding. 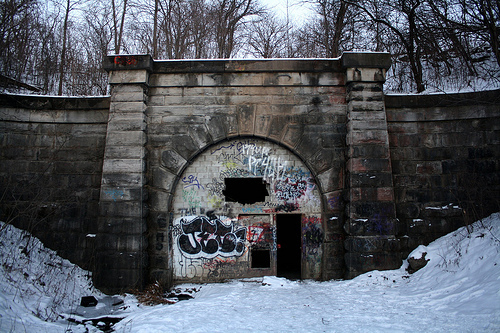 Nonetheless, the tunnel’s eerie reputation has drawn paranormal enthusiasts, many of whom believe its tragic history makes it one of the most haunted places in the region. The Blue Ghost Tunnel, properly known as the Merritton Tunnel, was constructed in the 1870s as part of the Welland Canal project – a massive and prestigious infrastructural development undertaken over decades by the fledgling Canadian government. The area saw massive upheaval, logging, and flooding in the name of the canal project, often without much regard for the current occupants of the land, living or dead, or to treaty agreements with First Nations communities who occupied much of the land. A claim filed by the Iroquois Six Nations council in 1826 over treaty violations and the destruction of some 2500 acres of their land has yet to be resolved. 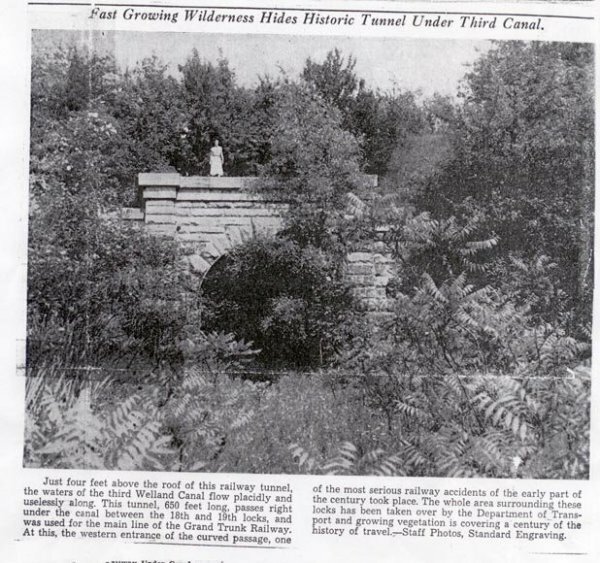 The tunnel itself was built near the site of an old Lutheran church and cemetery. When it came time to clear the nearby cemetery to make way for a pondage area near the tunnel, the government relocated only the graves of those whose relatives were able to come forward to put in a request. Because of the limited means of communication at the time, only 300 of the 917 bodies in the churchyard were claimed by relatives. Over 600 graves went unclaimed and were left to the waters when the area was flooded. To this day they remain submerged beneath the pond near the entrance of the Blue Ghost Tunnel. During the construction of the tunnel at least three deaths were reported, including that of an Irish immigrant who was only 14 years old when he was crushed to death in a rockslide. Nonetheless, construction carried on and the tunnel opened to rail traffic in 1876. It would close just 34 years later, but not before another gruesome incident marked its short lifespan. On the evening of January 3rd, 1903 an 80 ton eastbound mogul train and a westbound express train collided head-on right outside the entrance to the tunnel. The violent crash killed the firemen of both trains, Charles Horning and Abraham Desult. Newspapers at the time were filled with grisly descriptions of the firemen’s mangled bodies, particularly that of Horning. When rescuers found him he had been pinned by the flaming boiler. Engineers trying to free his body from the wreckage were horrified as his mangled limbs pulled away in their hands. One even recalled to a newspaper reporter the disturbing image of Horner’s still-ticking watch attached to his burnt and severed arm. The tunnel fell out of full-time usage shortly after this incident and was closed completely in 1915. Those who visit the cold, dark tunnel today often report seeing blue mist, hearing music or voices, or even being pushed and prodded by an unseen force. They also describe an overall feeling of foreboding. These experiences, though ominous, are only a hint of tragic history of the tunnel. While the untimely death of the teenaged worker and the grisly details of the train crash grabbed headlines, perhaps the most horrific aspects of the Blue Ghost Tunnel are the tragedies that never developed legends. There were at least 107 workers killed during the canal project whose deaths went largely unreported. The canal company contracted cheap labour, often teenagers and new immigrants from Ireland, Italy, and China. The more powerless the worker, the more dangerous the tasks they would be assigned. There was little public acknowledgement of the scale of the loss of life and in many cases the families of these workers were never even informed of their deaths. If anyone has unfinished business with the Blue Ghost Tunnel, it is surely those whose loss was least acknowledged. Once the prestige project of a newly independent country, the old Welland Canals have since been replaced. In 2014 a memorial was erected to honour the 124 workers who died building the current Welland Canal. No such monument exists for the hundreds thought to have died in the construction of the older canals. Today what hasn’t been incorporated into newer canals has rotted, been demolished, or exists as an anachronism in the contemporary landscape of southern Ontario. Crumbling pillars that were once used to support the canals now stand alone, posing a curiosity and a safety hazard. There is little trace of the sacrifice, betrayal, and bloodshed that went in to these now-frail edifices. 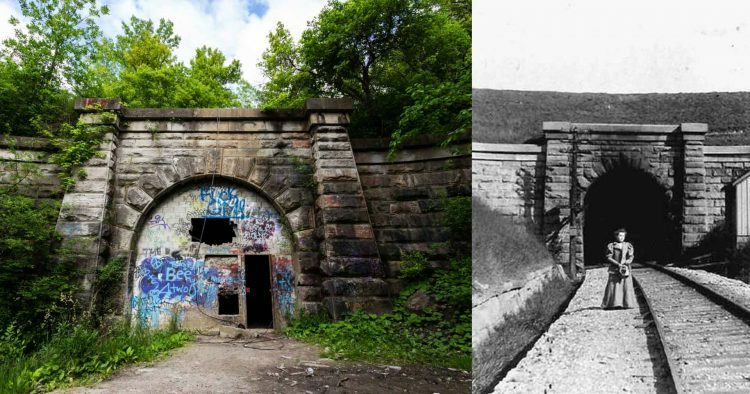 In 2006 the entrance to the Blue Ghost Tunnel was sealed up with cinder blocks, though today one can see holes which have been broken through the wall by persistent ghost hunters and urban explorers. The most haunted sites are not always found in Gothic mansions perched on hilltops, or behind the creaking gates of an old cemetery. Some of the most horrific legacies of any city lay beneath your feet, in the mundane infrastructure that we take for granted every day. 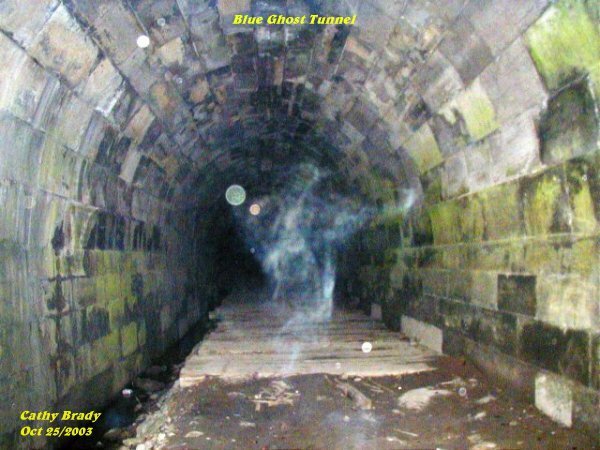 Whether or not you subscribe to the supernatural aspects of the legends surrounding the Blue Ghost Tunnel, its crumbling remains serve as a chilling reminder of a dark past, not quite paved over.